In many salons your hair is handled "assembly line" style; one person does your shampoo, another does your haircut, another does your color, and so on. Hair by Kathy is a personal salon - a salon where one master stylist creates a relationship with you - gets to know your personality, your interests, your tastes - and creates a hairstyle and look that magnifies all the things about you that make you unique. Earn Free Services or Products! 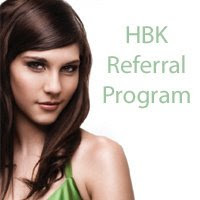 $5.00 Gift Certificate for each appointment made from your referrals. Start earning free services today!